To promote, preserve, and support the grand jury system through training, education, and outreach. Apr 13 2019 [Humboldt County] Letter to the editor: Wrong Jury Recent Blog Apr 13 2019 [Humboldt County] Letter to the editor: Wrong Jury In light of the recent decision of a grand jury in the matter of the death of David Josiah Lawson,... Read More..
Apr 13 2019 [Marin County] Letter to the editor: Not surprised about emergency radio woes Recent Blog Apr 13 2019 [Marin County] Letter to the editor: Not surprised about emergency radio woes Blog note: this letter references two grand jury reports. Regarding Marin emergency radio project... Read More..
Apr 13 2019 [San Diego County] Julian Fire Department in Final Days? Voter Fraud, Grand Jury Interest Alleged Recent Blog Apr 13 2019 [San Diego County] Julian Fire Department in Final Days? Voter Fraud, Grand Jury Interest Alleged Blog note: read the item about alleged grand jury interest toward the end of the article. Read More..
Apr 13 2019 [Humboldt County] Opinion: County civil grand jury: What we are and what we’re not Recent Blog Apr 13 2019 [Humboldt County] Opinion: County civil grand jury: What we are and what we’re not A March 13 decision by a criminal grand jury to not seek indictments in the Josiah Lawson case... Read More..
Apr 13 2019 [Kern County] Grand jury recommends City Council select sales tax committee members at 'random' for fairness and transparency Recent Blog Apr 13 2019 [Kern County] Grand jury recommends City Council select sales tax committee members at 'random' for fairness and transparency A Kern County grand jury is saying members of Bakersfield’s sales tax oversight committee should... Read More..
Apr 13 2019 [Kern County] Grand Jury provides recommendations for Measure N Citizen Oversight Committee Recent Blog Apr 13 2019 [Kern County] Grand Jury provides recommendations for Measure N Citizen Oversight Committee BAKERSFIELD, Calif. (KBAK/KBFX) — The Grand Jury released their recommendations for the Measure N... Read More..
Mar 22 2019 [Tehama County] 100 years ago: Tehama citizens must decide on new courthouse [history] Recent Blog Mar 22 2019 [Tehama County] 100 years ago: Tehama citizens must decide on new courthouse [history] Blog note: grand jury procedures were a little different 100 years ago, at least in Tehama County. Read More..
Mar 19 2019 [Los Angeles County] Pomona residents are calling for civilian oversight of police department, here’s how the chief sees it Recent Blog Mar 19 2019 [Los Angeles County] Pomona residents are calling for civilian oversight of police department, here’s how the chief sees it Blog note: this article references a 2018 Los Angeles County Grand Jury report. For weeks, a small... Read More..
Mar 19 2019 [Calaveras County] Calaveras County new economic development department bears fruit Recent Blog Mar 19 2019 [Calaveras County] Calaveras County new economic development department bears fruit Blog note: this article references a Tuolumne County grand jury’s report on the general subject. We... Read More..
Mar 19 2019 [Humboldt County] Letter: Civil grand jury is not criminal grand jury Recent Blog Mar 19 2019 [Humboldt County] Letter: Civil grand jury is not criminal grand jury In light of the recent decision of a grand jury in the matter of the death of David Josiah Lawson,... Read More.. 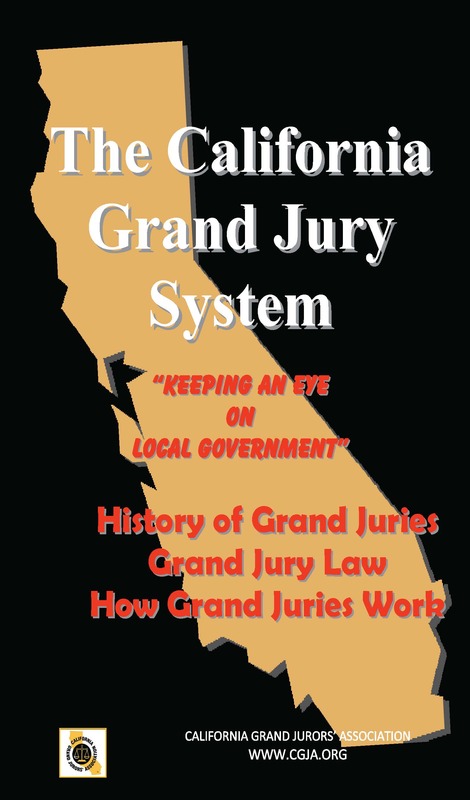 Contains important reference information mainly for impaneled juries, presents sample administrative documents developed by grand juries, links to websites that have information to support investigations, and frequently asked questions about grand jury procedures and operations. Presents documents, mainly developed by chapters, that may be helpful to other chapters in grand juror recruiting and orientation – and in grand jury report follow up (implementation review). Also presents guidance and sample documents for chapter formation. 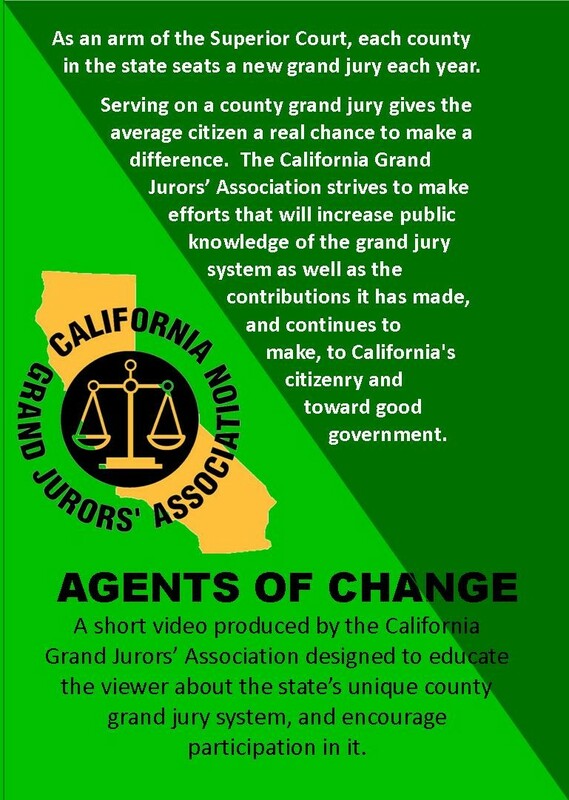 A major source of information about the civil grand jury system and CGJA, the bimonthly Grand Jurors' Journal contains CGJA announcements, chapter news, training information, and other topics of interest to our members. Every year in the fall, CGJA holds an Annual Conference/Membership Meeting at a different location. The conference provides an opportunity for members and grand jurors to meet and discuss experiences, ask questions, and otherwise engage in activities to enhance everyone's understanding of the grand jury system in order to contribute to CGJA's role in protecting and enhancing California's county grand jury system. The next conference is planned for November 3 - 4, 2019 at the Embassy Suites Riverfront Promenade in Sacramento. Stay up to date on key grand jury reports and CGJA activities through social media. Follow us on Twitter or like our Facebook page as an easy way to keep informed.